My bloggy BFF, Sandy, tagged me and I couldn't wait to play along! My favorite color changes all the time! Right now I'm loving green and navy blue together, like a peacock's feathers. Currently, Property Brothers. I love seeing how they can take a home that sometimes is basically falling apart and turn it into something fabulous. Ohio State. Brutus is our classroom mascot and I got this assortment of goodies from my students this past Christmas. O-H! It would have to be a strawberry vanilla twist cone from my favorite local soft serve. My husband and I really love to cook and eat, so this is a really hard question! I'd have to say the favorite dish that I make is my orange chicken. I also really like making cake batter cookies. Oh gosh, this is hard! I'd have to saw when my husband was my fiance and had been traveling for work for about two months. I was at work and one of my students yelled "It's Mr. Fish," during my math lesson. Yes, my kids called him Mr. Fish. My hubs had brought me flowers and lunch and then went outside with me for recess duty and played kickball with my boys and did my read a loud for me before he went home. It was a memorable day for myself and my students. 7. Favorite thing to do outside of school? I feel like I don't have much free time these days but I do enjoy cooking and lately I enjoy dreaming up ideas to decorate our new house. It would have to be You've Got Mail, I own all three versions and yes there are three. I'm going to break the rules and not tag a bunch of other people. Not that I don't want to but since I'm putting grades in and have to finish up my plans for next week, and super I'm crunched for time. Instead I'm going to highlight a blog I found today that I spent a good chunk of the morning reading. Organization does not come easy for me. I'm quite messy. Long before Pinterest, I would ask my super organized colleagues what worked for them and copied it. Before my last minute move to a different building this past summer, my classroom was VERY organized. This year, it's a different story, I haven't had a chance to make the space work for me yet and to be honest, I've known full well I could be moving at the end the year, either back to the school I was at for four years or to a different grade level in the building, so I haven't invested the time. Anyways, I discovered Elementary Organization today and fell.in.love! I love all of Eryn's great ideas for organizing small spaces, since my hubs and I currently live in a condo, I kept saying "Why didn't I think of that?" while reading her blog! I hope ya'll are joining your weekends! 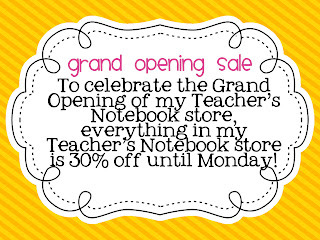 Don't forget about my grand opening sale! Click on the picture to head there! Love your blog name! Too cute. I love Emily Giffin too!!! I've read all her books! I also love Sophie Kinsella for summer reads. :) Hope you're having a wonderful Easter with your family!!! Wow, marvelous blog structure here......! You have made blogging very easy and grace full. The entire looking of your site is fantastic, and the content material is also interesting......!